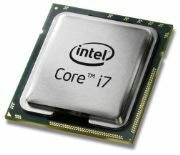 Intel's new "Bloomfield" quad-core Core i7 processors are the company's first to be based on its long-previewed "Nehalem" architecture. You see, the Core i7 family doesn't just mean new CPUs, they use a new chipset, a new system bus, and a new socket structure. In short, it's a whole new ballgame. This is the first major technology jump since mid-2006, when Core 2 CPUs showed up on the scene. Yep, in those two years since, we've seen incremental upgrades stacking on more cores at higher clock speeds while dropping the manufacturing process down to 45nm. But buckle up for what's next. Intel's existing Front Side Bus architecture is replaced with its QuickPath Interconnect (QPI) technology that ferries files at a peak rate of 25GB/second to help speed the data's journey. 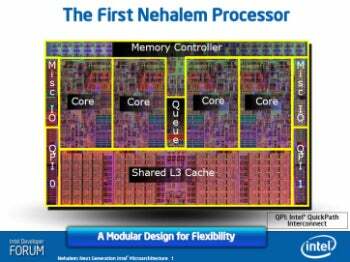 As I understand it, that is the theoretical limit, but not all the new Nehalem CPUs will approach that speed. Hyperthreading makes a come back. The four cores can each process two threads at once so the operating system thinks its dealing with eight CPUs. A "Turbo Burst" feature pushes individual cores into the red zone (133MHz to 266MHz over base clock frequencies) when a program calls for it. But this happens automatically in the background -- pretty much invisible to the user. Integrated memory controller supports three channels of DDR3 (only) memory per socket. By finally making it move off the North Bridge, latency will drop (just don't ask me the exact percentage, our tests haven't fully run their course, yet). Uses Socket B (LGA1366) for motherboard installation. This is the same socket type that's expected to be used by "Westmere" series CPUs; Intel's next major mainstream desktop processor update slated for Q4 2009. Intel also makes its move to step up Streaming SIMD Extensions (SSE) instructions to improve graphics and reduce times for transcoding video. It'll be interesting to see how this move stacks up to what Nvidia's been proposing for a while now: using a GPU and lower-end CPU with better, more cost-effective transcoding performance. Hey, Nvidia's been shouting out for a while now that you don't need a high-end CPU to do everything --I'd pay to see that grudge match. As we start getting in machines sporting Core i7 architecture, we'll be able to pit the two against each other and see whose solution is better. How much are these gonna run you? The 2.66-GHz Core i7 920 goes for about $300. The 2.93-GHz Core i7 940 costs in the neighborhood of $580. The meaty 3.2-GHz Core i7 965 Extreme sells for roughly a "mere" $1060. While I can't speak to how well it plays (we're still testing a bunch of Core-i7 equipped machines), let me direct you to our review of Falcon NorthWest's Mach V (or watch the video below) for more details. But I'm pretty impressed with the fact that Intel is making an aggressive price play on the baseline Core i7 CPUs. A powerful CPU that comes in for under 300 bucks is nothing to sneeze at -- and taking a swipe at AMD, which is well-known for cost-effective computing. Would I be likely to drop top dollar on the i7 965? Maybe when we start seeing more modern, high-end apps will be able to take advantage of all that Nehalem's new architecture has to offer.